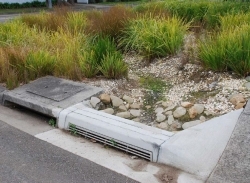 Manningham Council have released a second edition of their ZAM-WSUD handbook, which incorporates the results from their Performance of Turf Grass Species in ZAM-WSUD Stormwater Biofilters report. Zero Additional Maintenance Water Sensitive Urban Design (ZAM-WSUD) is a water sensitive urban design system that has been designed so that the ongoing maintenance implications for the asset owner are negligible. The challenge is simple: develop a raingarden design with ‘zero’ additional maintenance requirements compared to a typical kerb and channel streetscape. In addition to the City of Manningham, the partners involved in the design, development and trial of this project include Glen Eira City Council, the CRC for Water Sensitive Cities, Monash University and Melbourne Water. adding a protective layer of coarse sand on the surface of the filter media to help prevent the formation of a sediment layer. Testing of the prototypes showed that grass turf was thriving even over the hot summer period, and that the sediment grooves were working well. This process also allowed for slight design improvements which minimise health and safety hazards (tripping potential) and reduce the risk of clogging. The handbook provides a great overview of the project, with practical details and design plans. Simon would love to help out: simon.brink@manningham.vic.gov.au.